This weekend, the Wesleyan men’s ice hockey traveled around the northeast to play two road games against NESCAC rivals. The team is currently 2-1-3, coming off their first road win of the season, going 1-0-1 in two conference games this past weekend. In the first game of the weekend, the Cards took on Little Three-rival Amherst. The Red and Black got off to a slow start, but turned up the intensity in the second period. Down 3-1 with 14:58 left in regulation, the Amherst Mammoths answered by netting two goals in the third period. Regulation ended with the score locked 3-3, and after the overtime period, the game ended in a tie. The second game of the weekend was a big one. The Cardinals faced off against eighth-ranked Hamilton in Clinton, NY. Remembering last year’s season-ending 5-4 loss to the Continentals, the Dirty Birds came to the rink with a chip on their shoulders. The Cardinals started out hot, scoring the first three goals of the game, ensuring themselves against any Hamilton comeback. Wesleyan ended up netting two more goals, and despite Hamilton’s efforts, the Cards’ insurance covered enough damages. The Red and Black beat eighth-ranked Hamilton 5-3. This is an important win for the team, especially because it was a tough road game. Winning in a hostile environment is very difficult in a conference as competitive as the NESCAC, but in order to accomplish their goals, the Cards will have to show up in tough games. Head coach Chris Potter emphasized the need for sweep weekends, in which the team wins both weekend games. The men’s ice hockey team has a long way to go, but there are certainly some highlights so far. Senior Dylan Holze has continued to shine—in just six games, he has netted a team-leading six goals. Forwards Tyler Wyatt ’20 and Spencer Fox ’20 have each tallied two points against eighth-ranked Hamilton, showcasing their advantageous passing ability. Wyatt, playing with a chip on his shoulder after an injury-filled season last year, has also managed an impressive nine points after six games, seven of which are from assists. Holze agreed with the importance of team connection in fostering victory. 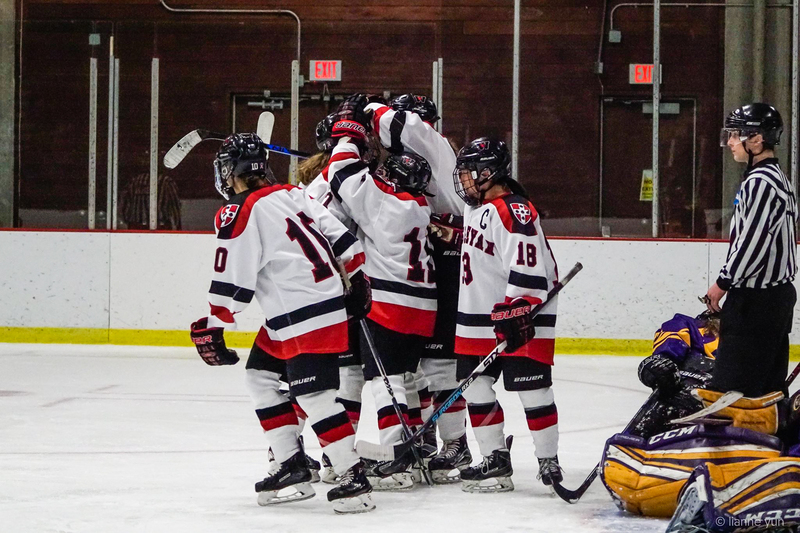 The Wesleyan women’s ice hockey team spent the weekend at home, playing their first NESCAC games at Spurrier-Synder Rink. The team is currently 2-3-2 after a pair of ties this weekend. 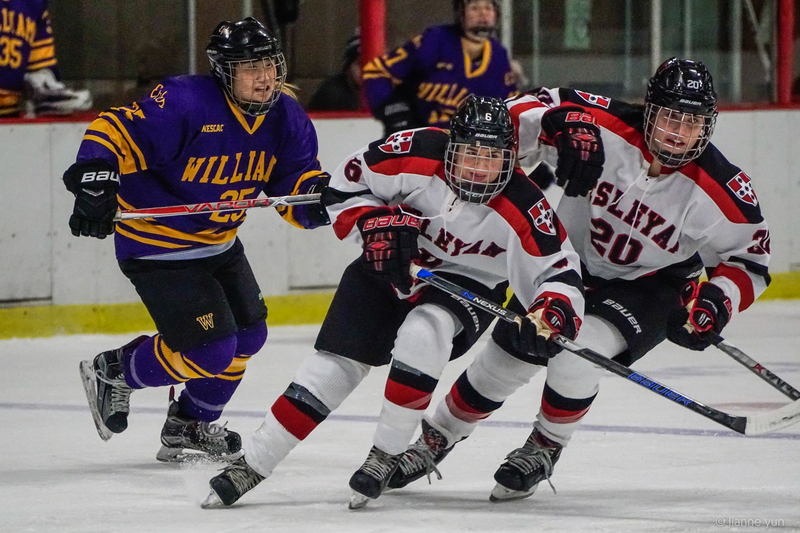 In their NESCAC opener, the Cardinals battled back from a pair of deficits and killed off over a minute of 4-on-3 power play action in overtime during a 2-2 draw against Little Three-rival Williams. The Cardinals made a great effort to knot the game at 2-2 in the second period. Off a creative feed by junior forward Gina Mangiafridda ’18, sophomore defensewoman Caroline Seibold scored an impressive power play goal from just inside the blue offside line. In the second game of the weekend, the Cardinals went seven-for-seven on penalty kills during a 2-2 draw against NESCAC-foe Williams on Saturday afternoon. Sophomore goalie Allegra Grant had a career-high 53 saves; of those 53, she saved all 17 shots she faced in the first period. Even when Williams was threatening in the overtime period, Grant showed resilience, saving five shots in the final minute and a half while the Cards were down 4-3 during a power play. In addition, the first goal of the game was a special moment: first-year forward Sydnee Goyer picked up her first point of her college career when she assisted freshman forward Sarah Takahashi’s first collegiate goal. Despite tying their rival, Williams, twice this weekend, the Cardinals aren’t satisfied. Alexis Banquer ’20 articulated the team’s intentions. “We want to be the toughest and the grittiest team to play against whenever we line up to face an opponent,” Banquer said. Up next, the men’s team will play Stonehill College at home on Saturday, Dec. 9 at 4:00 pm. The women will host a non-conference game against Endicott College on Friday, Dec. 8 at 8:00 pm. “We had a taste of what winning and success feels like last season and it is our goal this year to be even better, to score more goals, and to ultimately win,” Banquer said.